Paintball fanatics living in Bristol are lucky enough to benefit from not one, but two, awesome paintball centres! 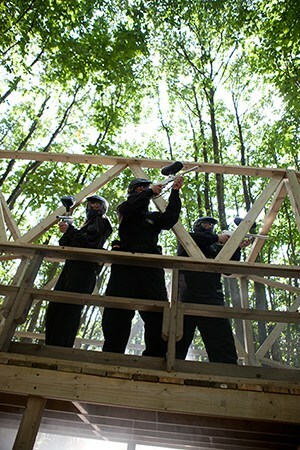 Delta Force Paintball Bristol (North and South) are located just 25 miles apart, in the gorgeous Bristol countryside. The North Bristol Paintball Centre lies in Thornbury, close to junction 14 on the M5 motorway, within lots of mixed woodland. 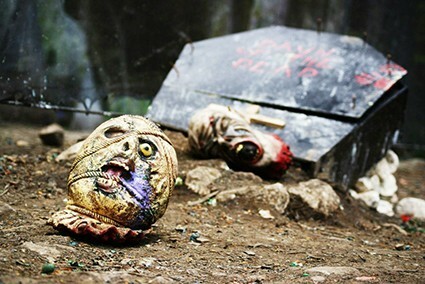 The venue features six thrilling paintball game zones for customers to enjoy, such as: ‘A Bridge Too Far’ where players need to fight their way through the heavily protected enemy postsand seize control of the bridges that connect the river; ‘Chemical Alley’ where players are given the mission of taking control of a safeguarded fuel depot; ‘Zombies’ Crypt’ which involves taking the ‘Holly Brook’ from the Dark Crypt’s altar and escorting it to the Zombie’s spawning point; ‘Viet Cong Village’ where players will come face-to-face with lots of hostile villagers, and ‘WWII Bunker Buster’ where you’ll need fight the Japanese opposition on the island of Iwo Jima. All of our game zones come with a number of movie-style props for customers to enjoy, including: several wooden bridges, dugouts, bunkers, military vehicles, village huts, churches, gravestones and more! Our high-tech game zones are some of the best in the industry, and one of the reasons why so many paintball fans choose Delta Force Paintball Bristol, over our competitors. The South Bristol Paintball Centre lies only 25 miles away from the North centre, and just a 20 minute drive from the city centre. It’s really easy to locate too – all you need to do is follow signs to Bristol’s International Airport, and it’s right next door! The game zones at this venue include: ‘D-Day Landing’ where players are ordered to trek up the Normandy coastline (making most of what little cover is available) and eliminate the German defence troops; ‘Tomb Raider’ where participants need to locate and acquire the sacred amulet, hidden inside a huge, ancient stone pyramid; ‘Chemical Alley’ – a quick-fire game – where your objective is to take out anyone that stands in your way and take over the depot, and ‘Sheriff’s Castle’ which involves taking control of the massive two-storey castle, guarded by the King’s soldiers. There’s a game scenario here for everyone to have ultimate paintball experience!